Home / Worlds day 3. Fleet on Fire! Worlds day 3. Fleet on Fire! 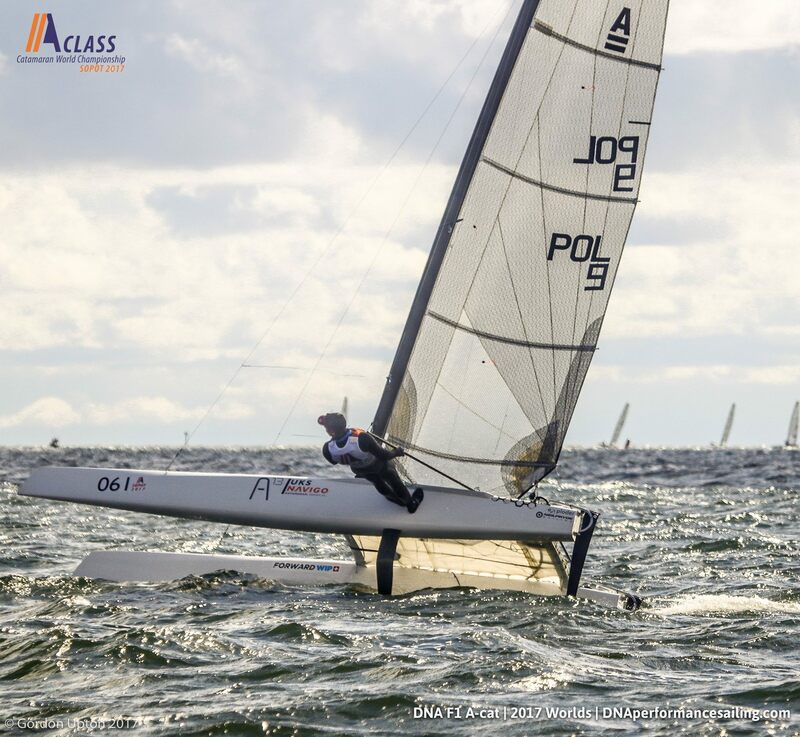 After the thunder and lightning of yesterday, many of the ‘A’ Cats sailing the current Worlds in Sopot were on fire today. The wind turned up in larger quantities than before in this regatta, with the sailors having to cope with 17+kts and 3ft seas. When things get to the upper end of the ‘A’cat’s envelope, these 75kg machines, powered by 150sqft of sail, start to get pretty lively and they begin jumping about with excitement. 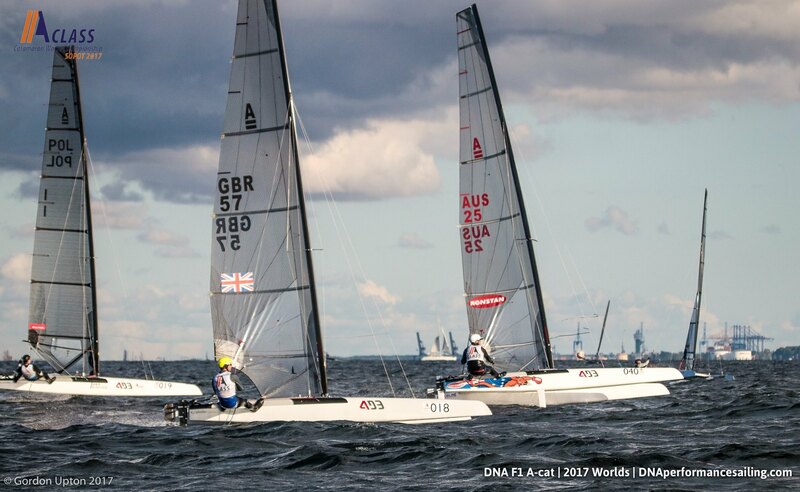 Tuesday’s cancelled racing meant an early start for the two fleets as the race committee needed to get the two outstanding qualifiers in before the medal fleets could be decided. 10am was the start, but those with slightly sore heads after the previous nights regatta dinner soon had something else to think about as then arrived at the beach. The direction, NNW, results in a sharp chop developing, so the competitors set of into that to get to the race areas upwind. Now we can all see why this is the place that Bundy described as "sailing in the Southern Ocean"! However, only one boat remained on the beach, a testament to the quality of the 126 odd field. It was the local Polish lads who showed the way, as expected. They sail in this stuff all the time, so it’s meat and drink to them. But one or two of the visitors showed them they knew the way too. On the B course, the Spanish ace Manuel Calavia, who would be at the top of the table were it not for his OSC in race 2, showed his continued form whilst being hotly pursued by the local aces Kuba Surowiec and Maciej Żarnowski. They finished in that order in both races. 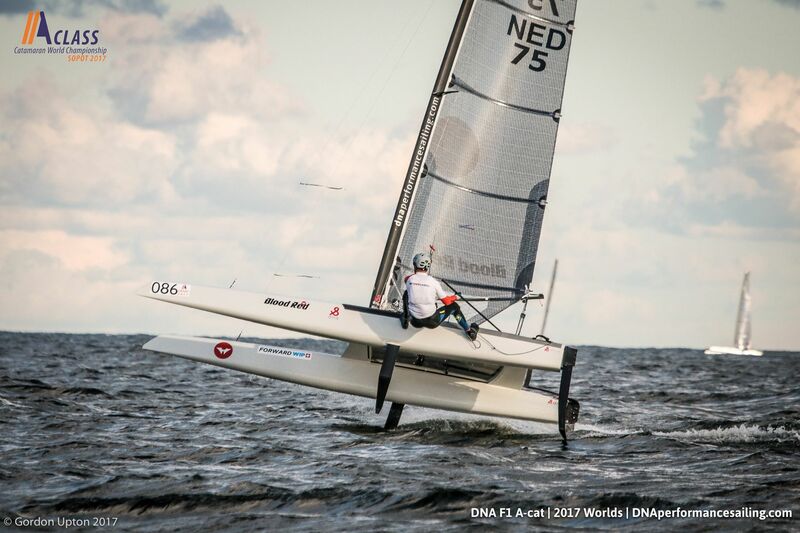 Dogged by bad luck in the previous races, getting two DNSs due to a breakage on the way to the start previously, Sergio Mehl, ARG National Champion, finally showed the rest of the fleet the way on his beautiful blue DNA F1. AUS sailor Darren Bundock, the leader of that fleet going into today’s races, ran over a fishing buoy, wrapping it around his rudder and cutting his leg, so he could only manage a 9th and a 7th, possibly putting the quiet, smiling Aussie out of the running for Champion in this exceptional fleet. 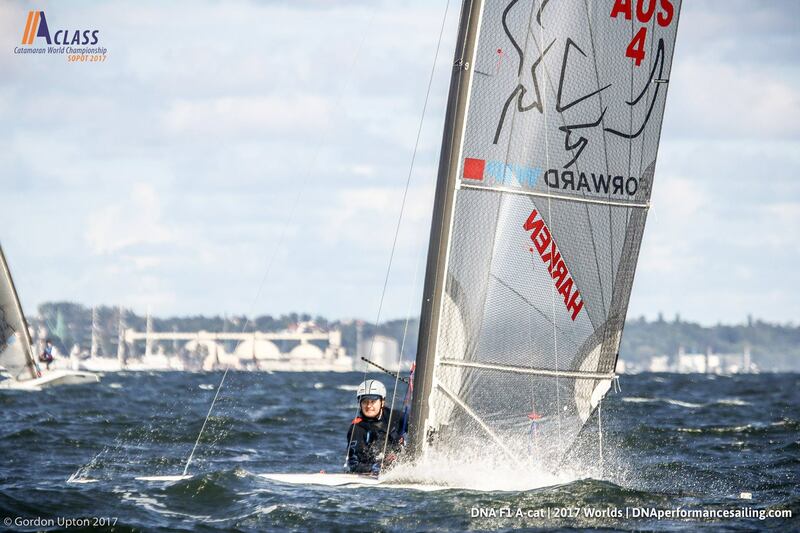 On the A Course, the battle was between Stevie Brewin AUS, Dave Shaw NZL and Tymuk Bendyk POL. They also had the reigning World Champ, Mischa Heemskerk in their race. Mischa looks to have relinquished his title though, following a disastrous second race when he did an extra lap in error, following a bottom mark capsize. He nearly repeated the stunt at the top mark today as he pushed Brewin on the first lap. But, he somehow managed to avoid a capsize by some miracle, as he arrived between the hulls of this DNS F1, and dragged himself back on over the front beam. Something many of us with dinosaur’s arms can only marvel at. Tuesday’s morning races were dominated by Tymuk, who, to be fair, has been sailing these waters since the age of 7, but also relishes those conditions. He blasted around the 3 laps only to be pipped on race one by Kiwi Dave on the last lap, who was also going like a monster all day. 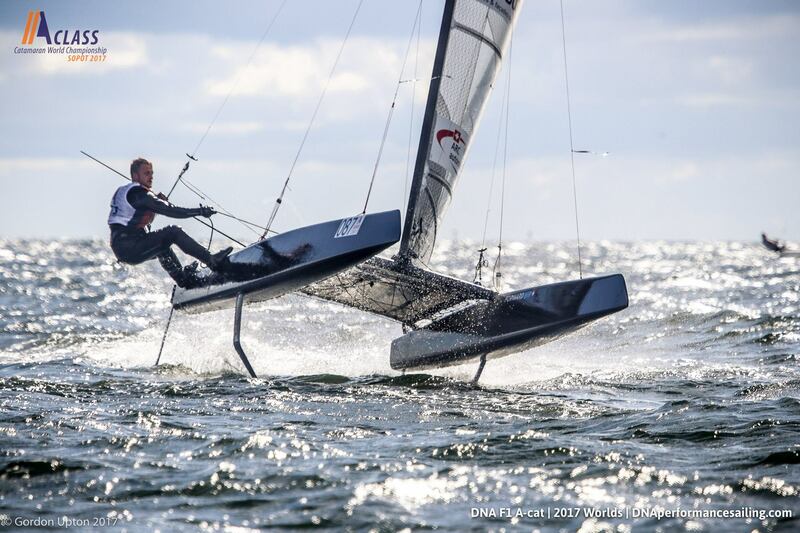 The second race would have also been his if it were not for a capsize, when he stuffed it in foiling downwind. He still managed to cling onto second though. Stevie, the fleet leader, could only manage a 3rd and a 5th, finding the downwind foiling conditions occasionally a handful, having elected to use his taller 9m rig for the regatta, rather than his cut down 8.2m mast which gives him better power control in the higher winds. Then it was all back to the beach to sort out the fleets into the Gold and Silver fleets. This took rather longer than expected as the jury had to hear 2 protests before the final list could be published. This happened at about 3.30pm. Many had changed into civvies and a few started to moan about the exhausting conditions to be endured yet again. Sitting around and an open bar probably didn’t help either. But, it is the Worlds, and the conditions were within the class bounds, so the first metal race was on. The conditions had abated a little and the wind was a nice 12kts, if somewhat shifty. The Gold fleet race was started and the fleet duly split into the right and left sides of the course. From the top of the course, it’s sometimes difficult to judge who made the correct call. Only when they start to approach the top mark, with an oddly sinister silence, do you see who was correct. It turns out that it was the right was slightly favoured. 9 mins it took them to cover the 1.5nm uphill leg. The front ones now firmly in an upwind foiling mode and going some 18-20 or so knts. They rounded the mark, then the spreader and all the leaders foiled off downhill again. The pack was led by NED sailor Roeland Wentholt and Maciej but they were soon mugged on the downwind leg by Brewin and Shaw. The next lap saw a course shortened and another top mark was put in lower down the course. The leaders, Brewin and Shaw, rounded that and foiled off left again, this time being chased by Calavia. The last lap saw yet another course change, as the wind had swung right 10 deg. Luckily, Stevie Brewin had red the sailing instructions, and remembered what the flags on the bottom gate meant. He was pulling ahead more now as his upwind foiling was more consistent than Dave’s. At the finish, Brewin had a decent lead. Dave followed in second and Manuel crossed in third. Marciej had his starboard bow chopped clean off on the previous downwind leg so was capsized in the middle of the course and was towed in still on his side. It’s getting a bit exciting, if you like that sort of thing!